There's no need to reinvent the wheel every holiday season. Though magazines and food blogs (yes, mine included!) love to share new and creative recipes each year, the truth is that many of us just crave our classic favorites--especially during the holidays! My secret to holiday entertaining that is both easy and creative is to add just a few small personalized twists to the classics. It's a way of putting a little bit of your own love and creativity into a recipe, without spending hours testing and trying out new things. It's so easy to do, too! Just think about easy ways that you can personalize some of your holiday go-to dishes. Is there an ingredient you love to eat or cook with? Is there a flavor that you almost always order when you go out to dinner? Think about ways that you can add it to your menu this year. My thing has always been smoky and spicy flavors. I love it in my entrees, my snacks, and even my cocktails! 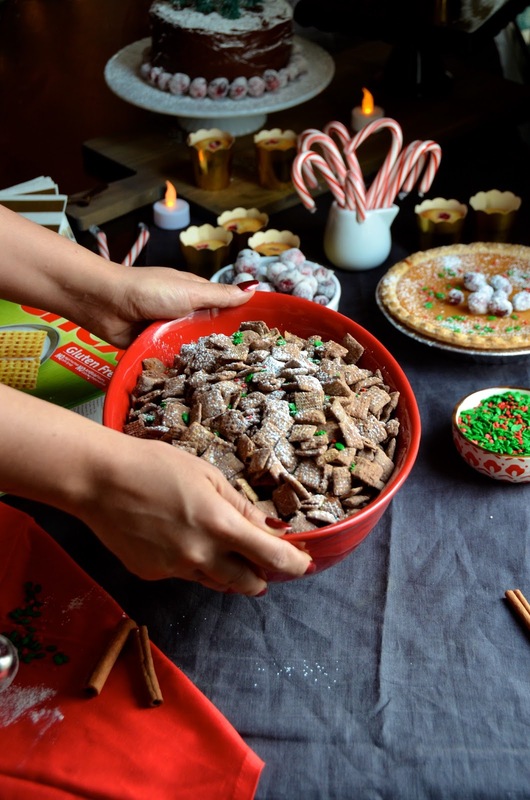 This year, I'll be serving it to my guests by adding a batch of these Mexican Hot Chocolate Chex Muddy Buddies to my Christmas party menu. The classic Chex Muddy Buddy recipe of chocolate and peanut butter is always a hit with my friends, but this time I'm making it my own by adding a bit of smoked paprika (my most favorite spice ever!) and cayenne (because I love a little heat!) to the mix. It's reminiscent of another recipe that I love--Mexican hot chocolate. Those warm, cozy, smoky flavors all work so well together--especially on a cold winter night. When it comes to the holidays, I'm always looking for recipes that can be made in advance and this is one of them. I make this a few days before the party (usually in a double or triple batch! ), then serve just before my guests arrive. This gives me the flexibility to enjoy and actually be a guest at my own party, while still offering up something fun that my guests will be excited to see and eat. 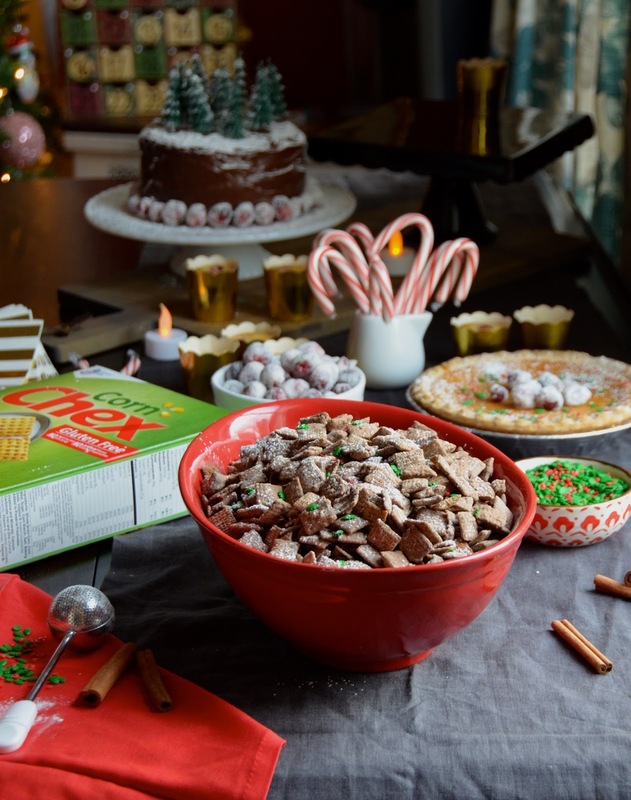 Thank you to Chex for sponsoring this holiday entertaining post! All opinions are my own. 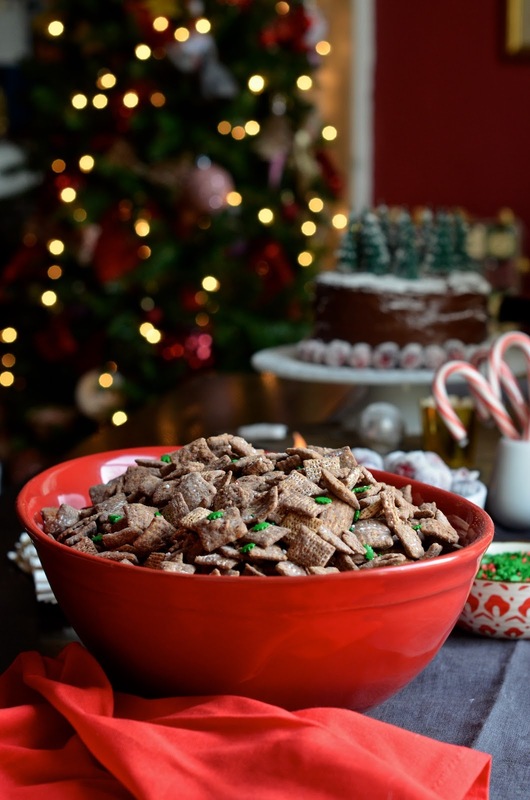 For more recipes and ideas, please visit Chex.com. 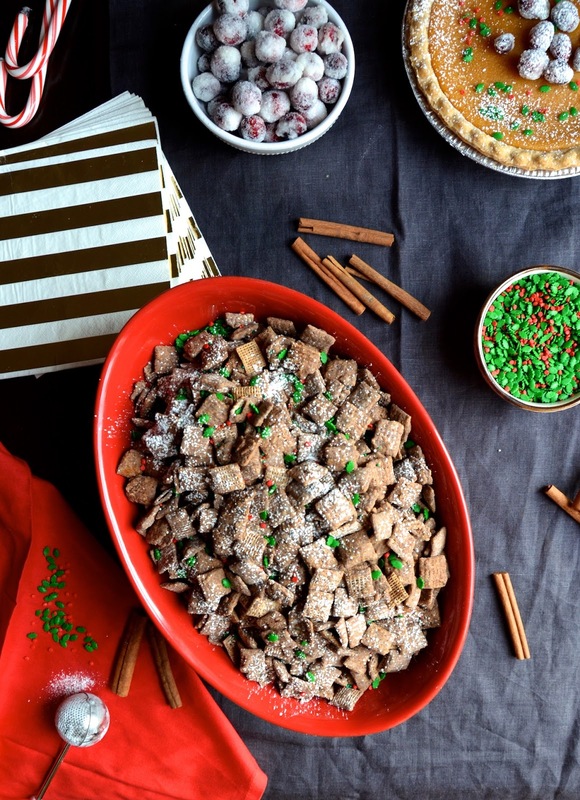 Add a spicy twist to the classic Muddy Buddies recipe. Place cereal into a large bowl. In a 1-quart microwavable bowl, microwave chocolate chips, peanut butter, and butter, uncovered on High 1 minute. Stir. Microwave about 30 seconds longer or until mixture can be stirred smooth. Stir in vanilla. Pour mixture over cereal, stirring until evenly coated. Pour into 2-gallon resealable food-storage plastic bag. Add spices, salt, and powdered sugar to the bag with the cereal mixture. Seal bag and shake until well coated. Spread on a baking sheet to cool. Store in an airtight container in refrigerator.